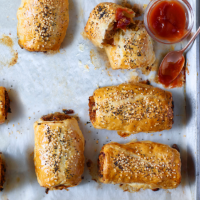 Few things compare with a home-made sausage roll still warm and crisp from the oven. For spring, mine are made with lamb mince flavoured with harissa, a simple but delicious twist on the classic. 1. Preheat the oven to 200˚C, gas mark 6; line 2 baking trays with parchment. Heat the oil in a saucepan over a medium-low heat and cook the onion with the garlic and spices for 6-7 minutes, until translucent. Add the pine nuts and harissa and cook for 2 minutes. Set aside until cool. 2. Use your hands to mix the onion mixture into the mince with the remaining filling ingredients until evenly combined, then set aside. Unroll the pastry sheets; cut in half lengthways to make 4 long rectangles. You only need 3 pieces, so chill the last one to use another time. 3. Divide the mince mixture into three and form into long sausages along the middle of each piece of pastry. Brush one edge of the pastry with the beaten egg. Fold the pastry over the mince mixture, pressing the pastry together to seal. Turn the long sausage rolls over, seam-side down, and use a serrated knife to cut each roll into 4 smaller rolls. 4. Put on the baking trays, brush with more beaten egg and sprinkle with the seeds. Bake for about 25-30 minutes or until deep golden. Leave to cool slightly before serving. Store in a sealed container in the fridge for up to 3 days; crisp up in the oven before serving.